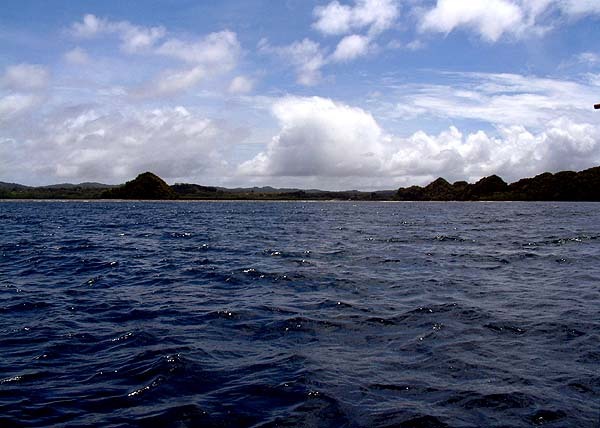 Approaching Airai Village from the lagoon. "The god Medechiibelau is said to have come to Ordomel from Ngetbang. Because of him, these two regions share a sense of kinship, which is often demonstrated by their visits with each other. "The people who eventually settled in Airai migrated from Delbochel, Peleliu, where they were heavily dependent on fruits for their sustenance. One day there was a very bad season which affected the fruiting trees greatly, so that they were forced to leave Peleliu in search of a new settlement. "They went north to Uluang, Ngeremlengui and then on to Delbong in Ngerechelong. It was here in Delbong that they met with the people who eventually settled in Ngchesar, with whom their journey to their final settlement in Airai Village is closely interrelated." Peleliu sits at the end of the reef platform, with Angaur lying below it. "The first settlers of Ordomel came from Delbocheng in Ngerechelong, where they escaped with the people who settled in a land now known as Ngchesar." In Ngerechelong, the Ordomel people were given low-status, menial work, and they were not happy there. "There are several versions for the reason why these people left Ngerechelong. One version claims that they were unhappy with the way they were treated by Ngerechelong people so one day they just could not stand anymore of it and escaped. "The second version has it that they were very bright and because of this, Ngerechelong people felt threatened by them and had planned on a war against them. Somehow they learned out about this, and this is what made them leave. "The third version says that their god Medechiibelau had just discovered a place they could settle in, so he came and helped bring them to their new place, now known as Airai or Ordomel." Steps leading down to the dock at Ngerbau, in Ngerechelong. "They escaped with the people who were living in Delbochel who were also unhappy with their lives in Ngerechelong. They traveled southward looking for a place where they can settle. Each place they passed by was already inhabited, until they came to Ngchesar. Ngchesar was a landing place for people from Ngersuul. They only used it when they went fishing, but no one really lived there. So they landed there and after some negotiation, those that lived in Delbong admitted that they liked the area and would like to remain there. "Those who lived in Delbochel wanted to move on because they could still see some land farther ahead. The spot they landed on and talked is called Itechedecheduch (discussion). Then the Airai people got back on their canoes and continued on their quest for a place to settle." "As they were approaching Medal, the people from Medal saw that it was such a large group of people. This worried them—such a large group, just too dangerous. So they waited for them on the landing place. "When they arrived, the Medal people told them about a place farther down, which was not inhabited and they could go and take it. So this group from Melkedek bypassed Medal and went on to what is now Airai Village and settled there. 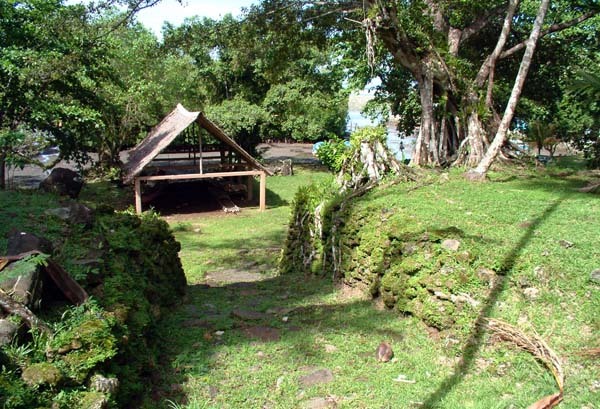 "So other than having left Ngerechelong together, Ngchesar and Airai are sometimes referred to as “Toilbeluu”—a settlement in between two previously established settlements. Ngchesar was established in between Ngerekesou and Ngeraus, while Airai was between Ngerusar and Oikull – both established settlements." 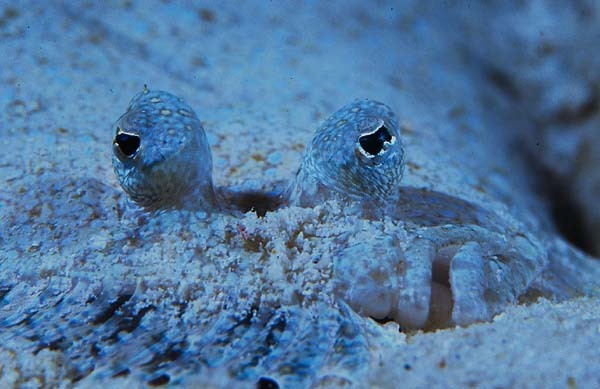 The flounder, rrai, has both eyes on one side of its body, as it lies flat on the sea floor. Photograph by Ethan Daniels, used with permission. "And so today, rrai is a local fish, a flounder. One side was removed by Medechiibelau, and today that fish remains the same: one-sided with two eyes on top, and was named rrai, because Medechiibelau is from Irrai (Airai). It’s flounder. We have them in Airai." But before these people arrived, and before Medechiibelau, the ancients lived in Airai.